SAN MATEO, Calif., BARCELONA and ZARAGOZA, Spain—November 17, 2014—Libelium is adding new Cloud technology options to its Waspmote wireless sensor platform by integrating the Cloud solution from Telefónica, the global broadband and telecommunications provider, to allow faster time-to-market for Smart Cities and Internet of Things (IoT) projects. Libelium creates hardware and open APIs for wireless sensor networks (WSN) used in Smart Cities, agriculture, water quality management and other IoT projects. A typical sensor network consists of multiple Waspmote sensor nodes transmitting to a Meshlium gateway that synchronizes with a Cloud system, connecting the physical world with the virtual world. 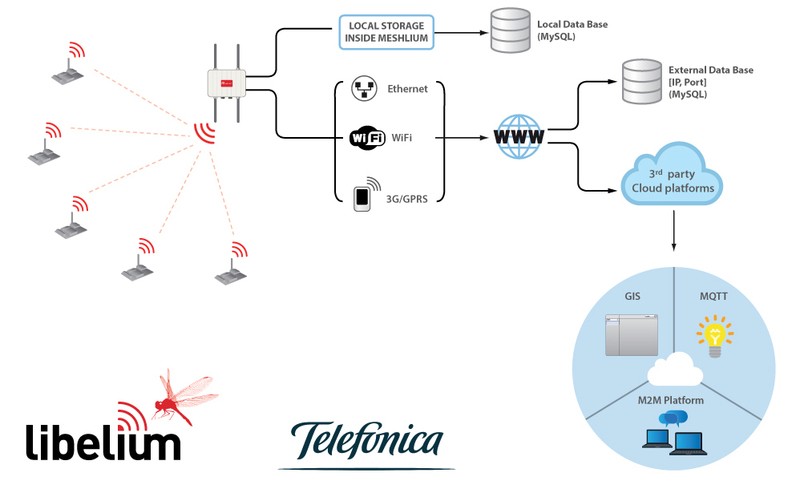 With the Telefónica integration, the Meshlium sensor network gateway is automatically configured from the factory to send data collected from the sensor nodes to the Telefónica Cloud for use in IoT projects, whether in cities, factories, parks or fields. Demos showcasing Waspmote nodes joined with the leading Cloud providers—including Telefónica’s Smart Business Control (SBC) Cloud—will roll out this week at Smart City Expo World Congress in Barcelona, Spain, at the Libelium booth #629. One demo shows an international fundraising initiative by the NGO Cáritas, where donations can be tracked in real time through the Telefónica Cloud and Libelium sensor nodes integration. Libelium’s Waspmote Plug & Sense! wireless sensors are already included in Telefónica’s Smart Cities solutions portfolio, powering applications such as traffic management, water quality, security, environmental control, and agriculture monitoring. “Our sensor platform is modular and our Cloud connector framework streamlines the configuration process, so we can offer access to the best Cloud software platforms in the market,” said David Gascón, CTO at Libelium.